I am glad to announce I will representing 2 impressive sessions in SPBiz Conference. 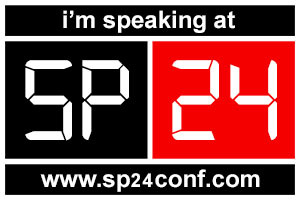 SPBiz Conference is 2 days, 17 & 18 June, it’s full of SharePoint Global Expert Speakers with many interesting sessions. The times are displayed below each session, but when you click the “+” (Add to Calendar) it should convert to local time. My Wish List for SharePoint 2016! Kindly, we have some wish list, we wish it would be available in SharePoint 2016, at least some of it..
Apps; when we insert apps as App Part, its basically inserted in iFrame! We really need a better way. MS, I hope you could include the Office Web App Server in SharePoint Server just like you did in FAST Search Server. We need a UI for Property Bags in Central Administration, it’s actually painful in PS. I don’t know why the Search Topology was removed in SP 2013, it was available with UI in SP 2010, I’d recommend we have a UI for Search Topology. Although I know there is PS to do so but there was already a UI. I understand the Search Topology changed heavily, which requires more work in its UI. The Workflow Manager – Register-SPWorkflowService. The Apps subscription required service application to be running although in UI; it doesn’t exists. The Restore-SPSite has no UI, although the Backup-SPSite has a UI. The Import-SPWeb has no UI, although the Export-SPWeb has a UI. The Translation Service Application, everyone saw it, we thought initially, no code needed but in order to use it, we have to write some code, why not make it easier. Device Channels, and adding the user agent, If just the user updated or upgrade his/her device, he lost the master page we did for his/her agent, it’s a very static thing and not dynamic at all; why not add screen margins instead or plus the user agent to change his/her master page based on the dimensions, I know this can be done from JS or CSS, but we have already a UI, Device Channels where we add the user agent, I hope we can add as well the screen dimensions; iPad, iPhone, Android, Tables/Phone.. and so on. We really need to have a field type “Multiple Browse/Upload”; a field where user can upload multiple images/docs from wherever, what we have now, is a site column where we can browse but max is one file; although this exists only in site columns and not when creating column in lists/libraries, to me is fine but to End User, he hates me when I show him how J .. lots of steps. We need a way to restrict sandbox on one web application and not on the other one on the same server! We did another server just to stop the Sandbox Solutions on one web application; even the Resource Points effects all web applications, we may need to make each web application with different Sandbox Resource Points. I know it is deprecated so no more enhancement here but just saying my wish list. This is what I can think of right now, I may add to this list more later. Please check the speaker’s slides as requested. I know some of you really need to see the installation from scratch, I will be pushing this out very soon, just keep following me. I’d like to welcome the SPSCairo Speakers J more info about each, you can read it here and session’s description are here. A SharePoint friend, is going to be missed really. It’s so sad as I am writing this.. I will miss you Dave, you were such a great friend, and shared great posts. You gave me the opportunity to write with you in your blog and always shared my posts. I finally made it and meet him, the below picture were in the European SharePoint Conference in Copenhagen – Denmark.